Are you driving Traffic to your website and creating the best exposure for your Listings? How about your Buyers - Are you the Community Expert? How do I use the right Blogging Techniques to help my web content and Listings become Internet Visible? this is the essence of Internet Marketing and Blogging Results. Learn what Google and Search Engines are looking for in Blogs in order to Index them... in fact if you Blog once a week the right way you will be on Page 1 of Google - enough said? 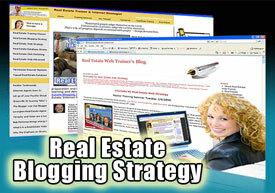 Most Realtors misuse Blogging; in fact 95%+ of all Blogs are pseudo-gossip. Learn the proper way to Blog and produce results; you will be able to bend Google to your content day-in and day-out. What is Blogging? – Very short time spent on this topic because the strategy is more important than the why. Why should Realtors Blog? Do I really need to learn how to Blog? Where should I blog? My website right? not really!!! What if the format of a good blog? At least can you get me started…? Do I have to become a writer? How about links? How can my assistant help me with this? Does this strategy really work? And how fast? Can you show us examples? "Good morning Key, I am checking different searches for Chapin Real Estate, Chapin SC real estate, Chapin homes for sale and Chapin SC homes for sale. Our efforts are working and I owe you a large debt of gratitude for this! Our website has been up for less than 1 month and we are on page 1 of Google for “Chapin Real Estate” and page 2 top spot for “Chapin Homes for Sale”. I consider this a major step forward in my companies ability to compete for customers on-line. The search, “Chapin Homeowners” is absolutely dominated by my blog and website-this is directly attributable to your guidance and tutelage! I am a long way from where I want our company to be in terms of our “google-ability” but our company and agents are headed in the right direction as a result of your instruction and support. "Key – You are not just an instructor, you are a Life Coach! You stretch our minds and uplift our Spirits!! Thank you for your dedication to our success. You empower us in our Professional life and that confidence spills over into our personal lives as well. The Psychic “Should” Purge is golden. Your database management class has taught us how to decrease our “should list”. I encourage all who can, take this class. It WILL change your life! Many thanks! - Shirley Ghorshi, Exit Realty South, Charlotte NC. Attended Real Estate Database Strategy in Charlotte NC, Wednesday April 1, 2009. 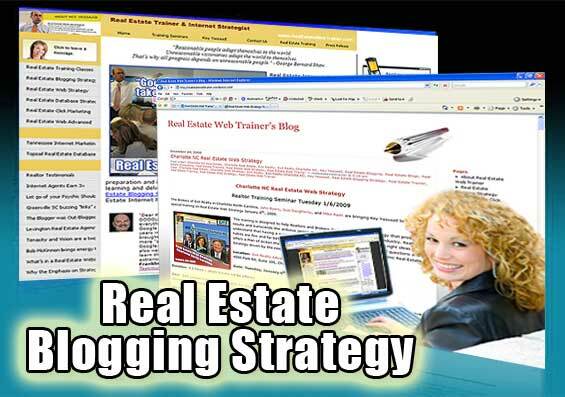 Real Estate Blogging Training, Real Estate Blog Trainer, Real Estate Web Training, Real Estate Blog Strategy Training, Real Estate Internet Marketing Training, Real Estate Training, Real Estate Web Trainer, Real Estate Blog Strategy, Real Estate Internet Marketing Strategy Training, Key Yessaad Trainings, Real Estate Blogs. To train, inspire, and coach Real Estate Professionals succeed is my passion. I specialize in training Realtors to compete online. My Trainings and Internet Strategies intersect in my seminars with powerful ideas and Plans of Actions that produce results. Google or call me (910) 538-6610 and let’s discuss how I can help your Agents climb the Google Tree of Success. I can tailor my Real Estate Seminars to the level of sophistication of your agents and I promise they will leave inspired and will produce results!!! Read some of the Realtors Testimonials.